To move heat between the rooms of your home and the earth, a geothermal heat pump system uses 3 types of loops, and 2 heat exchangers. 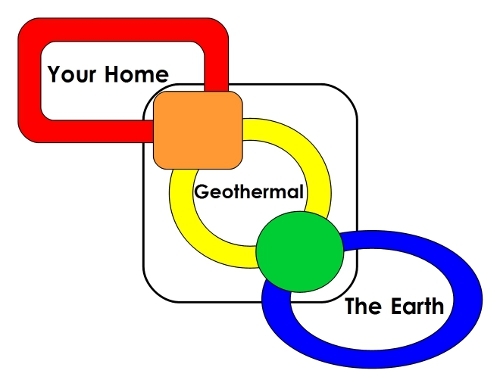 The earth loop moves heat between the earth, and the geothermal heat pump's water-to-refrigerant/Source-side coil. Inside the geothermal heat pump, the refrigerant loop moves heat between the two heat exchanger coils: the water-to-refrigerant/Source-side coil, and the air-to-refrigerant coil or the water-to-refrigerant/Load-side coil. The air ducting loop, or the hydronic piping loop, moves heat between the air-to-refrigerant coil, or the water-to-refrigerant/Load-side coil, and the rooms of your home.